There were many ways how to actually determine the location of bells. For instance, instead of listening to the recording and decoding them manually, you could open the sound file in a sound editor, take a screenshot of the waveform, and then arrange the parts for each bell size below one another. The figure below shows the waveform for the left ear arranged this way. 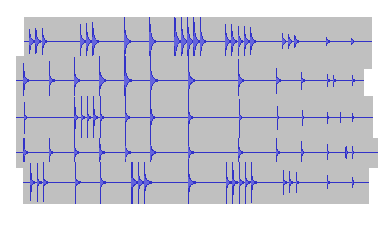 Note that in each row the sounds are getting fainter as we are getting close to the right end of the wall. Split the file into segments of length 0.1 s. Drop segments which are too loud. For each segment determine the mean absolute values of left and right channel. Denote them L and R. We calculate position as P = (L − R)/((L + R)/2). Do the Fourier transform of each segment. Let F be the first frequency which is loud enough. Visualize each segment as a bubble where the x-position is P * abs(P) (for better visualization) and the y-position is F. We also make the size of bubbles proportional to the intensity of the sound. Even with the noise we can see that the answer is JACUZZI. The third letter is indeed C and not O (bubbles on the left edge have three different y-positions but bubbles on the right edge have two). The bell samples were created by angstrom and are available online under a Creative Commons 0 license. Thanks!